Almost Like a Surreal Marvel Comic Book Title: "What If a Black Sif?" - Afronerd: The Blerd Revolution Has Begun! Home > SCI-FI/ FANTASY > Almost Like a Surreal Marvel Comic Book Title: "What If a Black Sif?" Almost Like a Surreal Marvel Comic Book Title: "What If a Black Sif?" Based purely on conjecture, this is VERY early concept art since Jaime Alexander was cast as Sif fairly quickly. In fact, if you go through Manser’s entire Thor gallery, you can see the stylistic change that occurs once he was told Alexander had gotten the role. All the Grace Jones-inspired looks have numbers in the teens while Official Sif™ shows up at 26. Whether Manser had insider casting information now lost to the mists of Hollywood lore, or he just like the aesthetic of 1980s dystopian future fashion is a mystery. What isn’t though is how amazing some of these designs are. 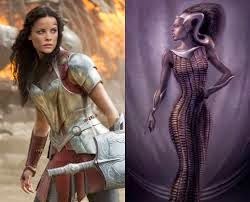 After the jump, enter a world where Lady Sif was a fashionably fabulous woman of color.